Originally published under the title, "Turkish Fairy Tales from Uncle Tayyip." Does Turkish President Recep Tayyip Erdogan think of himself as a modern-day Saladin who will conquer Jerusalem? It is truly fascinating that Turkish Prime Minister Ahmet Davutoglu, a professor of political science, believes that Jerusalem, built a millennium before the birth of Islam, is originally a Muslim city. And that Turkish President Recep Tayyip Erdogan, -- Saudis should please not get offended -- thinks Jerusalem is the Muslims' "most important Mecca." Jerusalem has always had a spectacular place in a Turkish Islamist's heart and mind. But pre-election fervor in Turkey has lifted their "Jerusalem fetish" to new heights. Turkey's Islamists today look like Egypt's second president, Gamal Abdel Nasser, a Pan-Arab nationalist, and his army commanders almost half a century ago. On May 16, 1967, Nasser ordered U.N. Emergency Force Commander, Indar Jit Rykhye, to evacuate his force from the Sinai buffer zone within 48 hours. When Rykhye asked one Egyptian commander if Egypt was aware of the consequences, the commander replied: "Oh sir, I'll meet you at lunch in Tel Aviv." The UN force left, and Egypt and Israel were left alone to fight the 1967 war. This author does not know where the Egyptian commander had lunch the next day, but definitely not in Tel Aviv. His words, however, may have inspired Turkey's leaders. Pre-election fervor has lifted the "Jerusalem fetish" of Turkish Islamists to new heights. Prime Minister Davutoglu, formerly foreign minister, has reiterated countless times since he joined the Turkish cabinet in 2009 that, "We will have prayers at the al-Aqsa mosque in the Palestinian capital 'Quds' ([Jerusalem]." This wish remains to be fulfilled. But that does not discourage Turkish leaders from cherishing increasing doses of "Jerusalem-fetish." When a Kurdish politician said in a public speech that "Jerusalem is the holy city for the Jews," a furious Davutoglu held a rally and said at the top of his voice: "Jerusalem is our holy place;" and that he would never allow the city's "Islamic character" to change. Davutoglu, in another election rally speech, added: "One day al-Aqsa will definitely reach liberation ... Jerusalem is our eternal cause." In yet another speech, Davutoglu claimed that his government has faced multiple coup d'état attempts only because he says "Jerusalem is our cause.". In still another, he claimed that Jerusalem's final period in peace was "our (Ottoman) times." And in another, he commemorated "the Turks, Arabs, Kurds, Zaza (a Kurdish tribe) and Arab in the glorious army of Saladin." It is as if, for Davutoglu (and Erdogan), Jerusalem did not exist before 1187. If it did not, why do the Turks talk about its "conquest," a euphemism they always seem to prefer to avoid the word "occupation" or "invasion." President Erdogan has no less-eccentric ideas. "Jerusalem," according to the president, "is the holiest place of Muslims and it belongs to the Palestinians." In a recent speech, he claimed that Jews are [secretly] educating people on the Zoroastrian faith at mountain camps. "We have evidence [to prove] that," Erdogan added. Yet he has never produced this "evidence." President Erdogan said in a May 15 speech that Muslim hearts are "destined to beat for Jerusalem." Most recently, in a speech on May 15, Erdogan said that: "Unfortunately we the Muslims lost our aim to head towards Jerusalem. The water of our eyes froze, making us blind, and our hearts that were destined to beat for Jerusalem are now instead conditioned for rivalry, in a state of war with each other." The time has come for the Islamic nation to unite around one man for the sake of Jerusalem and Palestine ... The Jews have dominated the land, spread corruption on earth, spilled the blood of believers and in their actions profaned holy places, including their own ... Zionists only understand the language of force and will not relent without duress ... This will only happen through holy Jihad, high sacrifices and all forms of resistance. The day they realize we will march this path and raise the banner of Jihad for the sake of God, is the day they will relent and stop their tyranny. Is Erdogan that one man around whom the Islamic nation should unite for the sake of Jerusalem and Palestine? 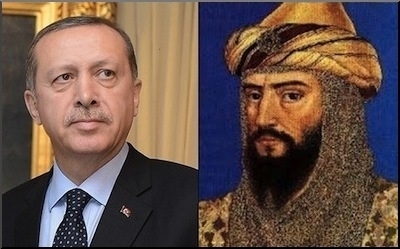 Erdogan may be thinking that he is the 21st-century reincarnation of Saladin. So may be his Muslim Brothers and Qatari allies. For the rest of the Muslims, all that is merely "fairy tales from Uncle Tayyip."